This is a review of Karite Gold’s Athlete’s Foot cream. This product claims to help fight fungal infections like athlete’s foot. Read on to learn if this product is right for you and your symptoms. There is no official ingredient information listed online but the description of the product notes that it is made of shea butter and infused with lavender and myrrh essential oils. Shea butter is an excellent moisturiser which will soothe dry and flaky skin. Some studies have suggested that shea butter may help heal fungal infections but the studies are inconclusive. Myrrh oil is more often used to stop swelling in the mouth. It is also sometimes used topically on wounds, boils and bed sores. Lavender is often used to treat insomnia, depression and general nervousness. It is also used to treat many other things like migraines, alopecia, upset stomach, loss of appetite or nausea. The instructions on the Amazon listing state that you should apply a reasonable amount of the cream to the affected area three times a day. You should make sure that the shea butter reaches all of the affected areas on your skin by moving your hands in a circular motion when you put on the cream. If you are pregnant or breastfeeding, you should consult your doctor before using this product. Myrrh has been known to stimulate the uterus and potentially cause a miscarriage. Lavender oil is possibly unsafe for young boys who have not gone through puberty as it may stimulate abnormal hormones which cause abnormal breast growth. Myrrh may cause rashes if it is applied directly to the skin. Large doses of myrrh are unsafe and if you exceed the recommended amount, you may experience kidney irritation or changes in your heart rate. Amazon lists this product as available for purchase from $21.95. The product description describes the jar as a 40 oz container but it is not clear how many doses that will provide. The manufacturer does not list a guarantee for this product. There are no reviews available on Amazon for this product. The manufacturer’s website has not been located. 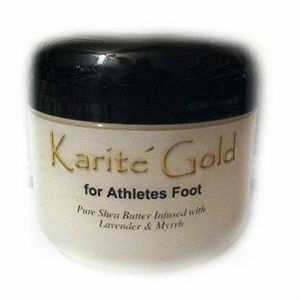 Karite Gold’s for Athlete’s Foot is a product that is made from pure shea butter which is an excellent moisturiser for the skin. However, there is very little information provided by the manufacturer. It is unclear how shea butter would be effective in removing fungal infections like athlete’s foot. The added essential oils are not traditionally used to treat fungal infections either, as lavender is usually best suited as a product to help you relax. The description provided on Amazon states that shea butter has antifungal properties but it does not cite the study that this claim is backed by. There is not a full list of ingredients for this product provided by the manufacturer so it is unclear if there is another component that has been added to the shea butter to make it more effective. Jimmy Rodriguez	reviewed Karite Gold Athlete's Foot	on June 10th	 and gave it a rating of 2.5.